The creation of the Panama Canal one hundred years ago was far more than an unprecedented feat of engineering; it was a profoundly important historic event. It represented the largest, most costly single undertaking ever before mounted anywhere on earth, and it held the world’s attention over a span of forty years. Costing $387 million, it was an engineering miracle that changed the world by dividing a continent. The importance of the Isthmus of Panama was sealed in 1513 when Vasco de Núñez de Balboa led a straggle of Spanish colonists through the jungle from the Atlantic to the Pacific. Their route was followed in 1671 when the Welsh pirate Henry Morgan and a band of two thousand brigands hacked their way through endless rainforest to the city of Panama which they promptly burned to the ground. At the end of the 17th century, the Scots tried to establish a foothold in this region of Central America with the ill-fated Darien Scheme. All that remains of their efforts is the small island of Caledonia and the overgrown settlement of New Edinburgh. Almost two centuries later, French engineers led by Ferdinand de Lesseps – fresh from his triumph at Suez – believed, rashly, that he could link the Atlantic and Pacific with a sea-level canal which became known as ‘Le Grand Projet’. Of the many problems they faced throughout the 1880s, the worst was malaria which claimed 26,000 lives. The last great enterprise of the Victorian era was such a resounding failure that the term Panamiste became one of abuse in France. France’s folly became America’s dream. Within a few years the first grandiose show of American power and industrial might at the dawn of the new century was unleashed in this narrow isthmus that umbilically links the vast North American continent with its southern counterpart. By helping the Province of Panama gain independence from Colombia, Theodore Roosevelt acquired a licence to build, operate and police a canal, as well as the land on either side of it. With malaria eradicated in the steamy jungle that borders the canal, 40,000 men – Chinese, Indian, and African indentured labourers – were engaged in the construction. Over 200 million cubic yards of material were removed, almost half of which came from the Gaillard Cut alone, as solid rock and shale was blasted by nineteen million pounds of dynamite. Years of death, toil and engineering tenacity finally paid off. Seizing the strategic potential, American expansionism took off in earnest. The first transit of the Canal was on 15th August 1914 by the SS Ancon, and in a stroke the arduous 8,000 mile voyage around Cape Horn that could take up to several weeks, or even months, was reduced to a mere eight or nine hours. The multi-lock waterway of the Panama Canal runs for 51.2 miles north-west to south-east across the mountainous terrain of the isthmus and joins the world’s two greatest oceans. Paradoxically, due to the diagonal construction of the canal, ships travel from west to east navigating from the Atlantic to the Pacific. It is also the only occasion when the Captain of a ship temporarily defers command of his vessel in favour of the senior canal pilot. There are currently three sets of locks, each lock chamber measuring approximately 1,000 feet in length; 110 feet in width and 41 feet in depth, and are some of the world’s largest poured concrete structures. The 65-feet wide lock gates are seven feet thick and are so finely balanced that, despite their enormous weight, can be moved by a 40 horsepower motor. Each lock chamber holds 65.8 million gallons of water, and every time a ship makes a complete transit of the canal some 52 million gallons of fresh water are spilled into the sea. It is estimated that the amount of water consumed in the operation of the canal in one day would keep the city of Birmingham supplied for two weeks. No pumps are used in filling the lock chambers; the principle involved is no more complicated than gravity. With the Gatún Lake being the highest point of the Canal at 85 feet above sea level, the water flows from one level to another through 18ft culverts located at the centre and side walls of the locks. There are 40 pairs of lock gates in the Canal. 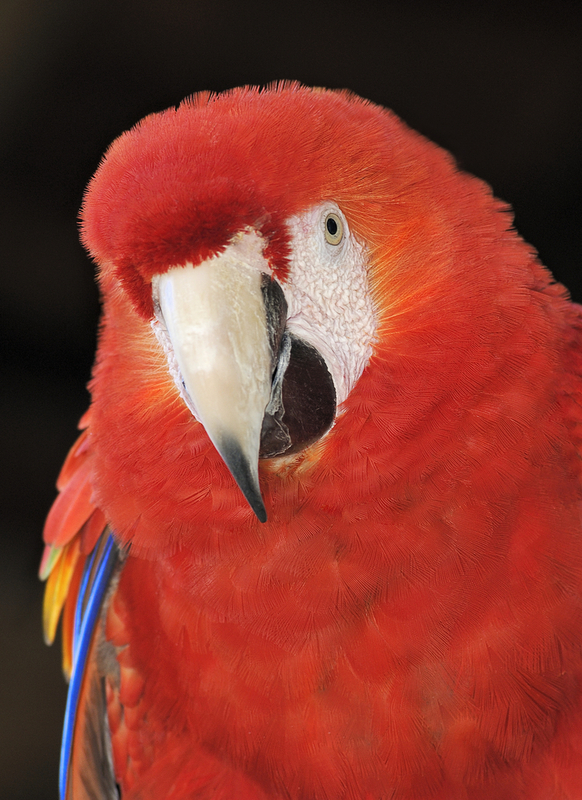 These are located at each end of the chambers and vary in height from 47 to 82 feet. The tallest and heaviest gates are on the Pacific side at the south-east entrance to the Miraflores Locks and were designed to handle that ocean’s extreme tidal fluctuations. At the Gatún Locks on the Caribbean side, vessels are lifted in three stages to the Gatún Lake. Specially-trained Canal Pilots communicate continuously with a control centre as well as to linesmen and the drivers of electric locomotives, known as ‘mules’ which, working in pairs, run on tracks on both sides of the locks, preventing ships colliding with the lock walls. Once the Gatún Lake has been traversed, vessels enter the 7.8 mile Gaillard Cut – the narrowest stretch of the entire canal – which bisects the Continental Divide. 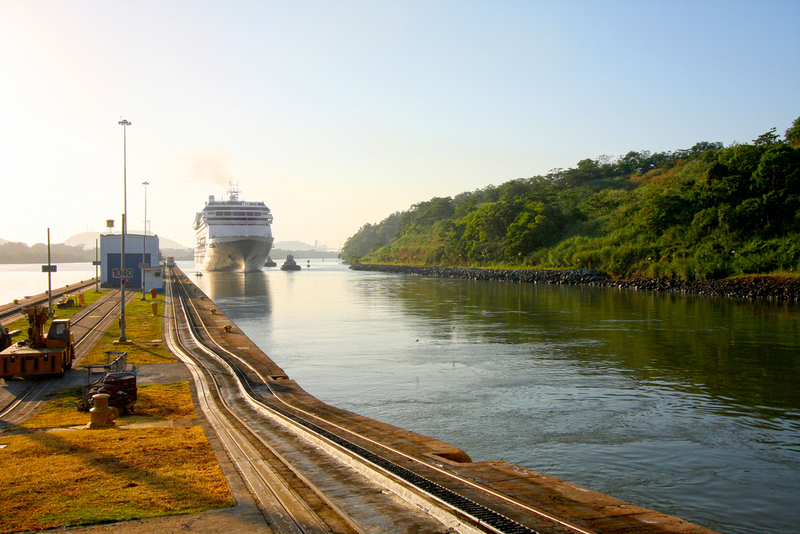 At the Pedro Miguel Lock vessels are lowered 31 feet to the Miraflores Lake. This is followed by the Miraflores Locks where the two chambers lower ships 54 feet down to the Pacific Ocean – which can often be up to two feet higher than the sea level of the Atlantic. During transits an ‘Admeasure’ boards each ship to define its Panama Canal tonnage, and from that the toll for each transit is determined. Back in 1928 Richard Halliburton paid just 36 cents in tolls when he swam the entire canal in ten days; tolls now generate many million dollars each day. The largest cruise ships (known as Panamax – up to 965ft long and 106ft wide) pay in excess of $450,000 per transit. At midday on 31 December 1999, as required by the Panama Canal Treaty, the United States transferred ownership and operational control of the Canal to the people of the Republic of Panama. 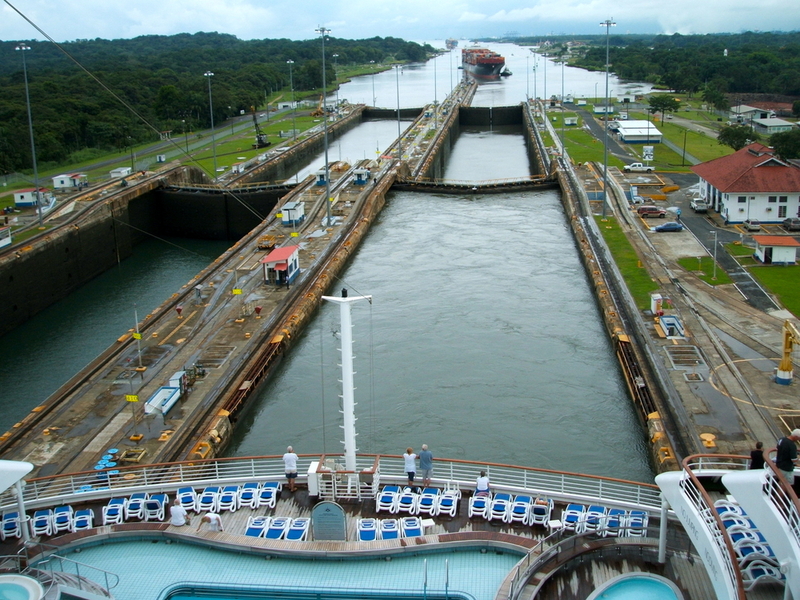 One of the first acts of the new Panama Canal Authority was to comply with the recommendations of the most influential people in world shipping and forge ahead with plans for an historic expansion of the canal by means of a third set of locks. Approved by a national referendum in 2006, this $5.25 billion project is scheduled for completion next year. There will be two new sets of locks – eight at the Atlantic entrance to the waterway alongside the Gatún Locks and eight at the Pacific inlet adjacent to the Miraflores Locks. These will not replace but augment the existing locks. This new single-lane of locks will be 65 per cent larger than the current chambers and will double the canal’s capacity by allowing for the transit of larger and wider vessels up to 1,200 feet long, with a 160 foot beam and a 50 foot draft. Currently an army of workers are toiling around the clock pouring tens of thousands of cubic feet of concrete into the three-step lock chambers and the most powerful dredging equipment in the world is deepening the waterway’s entrances. Huge excavators are creating nearly five miles of access channels that will join the new locks with existing shipping lanes. Instead of hinged mitre gates the new set of triple locks will use paired rolling gates, weighing an average of 3,100 tons each, which will roll out from wall recesses on tracks to seal the chambers. The design of the new locks incorporates environmentally-friendly recycling basins that will reduce the amount of water required for each transit by seven per cent. 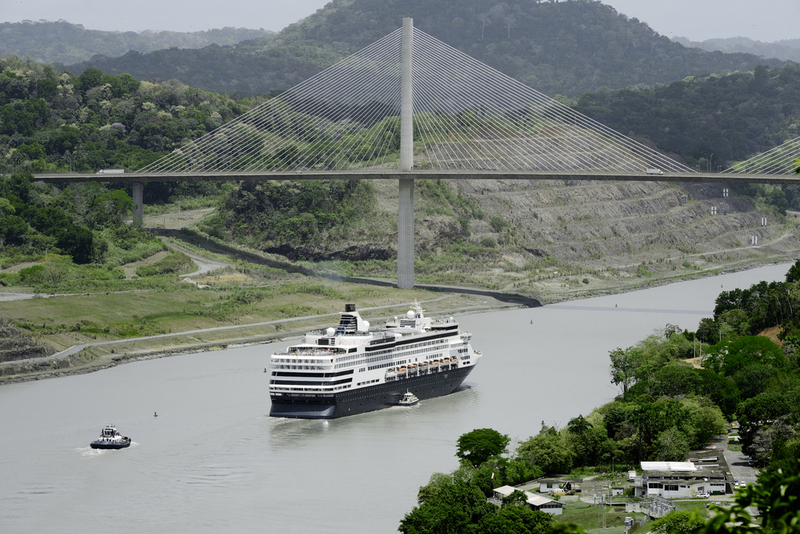 Once the new locks are operational the only limiting factor to the world’s largest cruise ships such as Cunard’s Queen Mary 2, will be the Bridge of the Americas – the arched structure which crosses the Panama Canal. This integral part of the Pan-American Highway has a clearance of 201 feet. Such a restriction can only be overcome if the resourceful Panamanians raise their strategic road link between North and South America. Perhaps the story of the ‘Big Ditch’ has another chapter waiting to unfold.